I have finally got around to overhauling my blog and will hopefully be far more proactive!!! Anyway, for those of you who can remember as far back as April this year, you will remember that Autodesk promised a Google Earth plug-in when Revit 2008 was released. After some delays, they have finally got around to releasing it. It is only available for Subscription users and you will need to download it from the Autodesk Subscription Center. I've taken a look at it and it is very good. 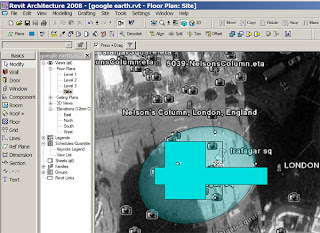 You can have the ability to import a Google Earth image into directly into Revit. This allows you to sketch over the top of this image, using it as a guide. You can then be assured that any geometry you place in relationship to the image will get passed back directly into Google Earth in the correct location. This is very similar to the way Sketchup and Google Earth work. In addition to this, you can export a KML/KMZ file from Google Earth and then import this into Revit and it will realign the project location with Google Earth location. You can then publish model from Revit back into Google Earth. Also,when you publish your model a dialogue box appears which allows you to control which categories are passed back to Google Earth, which is helpful. In reality, if you have a large model you will not want to publish the whole model as its likely to push Google Earth over the edge! You may want to consider either setting up worksets or filters to the control any geometry you pass back to Google Earth. 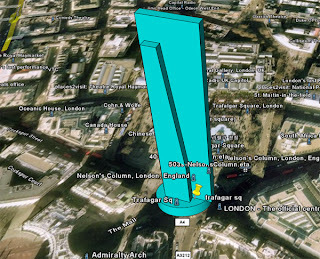 HI David, been trying a few things with the ol Revit / Google Earth tie plugin. One thing i've noticed is...I have a Revit job thats been tied to coordinates from actual AutoCAD survey drawings, everything works fine with regards the tie in between the Autocad and Revit, it should do it's been set out on site. You would therefore expect the Exported KMZ to be in the 'zone'. I published the KMZ from the accurate Revit SITE model. Great wee tool....it further highlights the power to achieve a quick study.